Product successfully added to your quotation request. There are 0 items in your quotation request. There is 1 item in your quotation request. Use the high absorption capacity of the 24 pre-cut sheets of this adhesive roll, to take dogs ands cats haire off your clothes, armchairs, cushions. Use it at home or in your car. Sold in its carrying case. C0768 : 1 adhesive roll with pre-cut sheets + case C0767 : 2 refills for 48 sheets for adhesive brush Oh my dog ! Formula without water, fast and easy to apply, to gently clean, condition and moisturize the coat. Oh My Dog forming mousse is suitable for all breeds of dogs and cats. Perfect between two shampoos, for travelling and for pets that don’t like water. Protein shampoo for frequent use. Dilution 1 for 5 vol. of water. Available in 1, 5 or 20 liter. 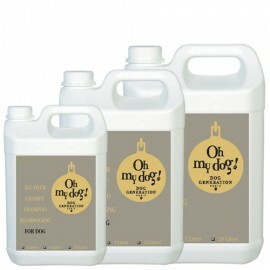 Oh My Dog all over protein shampoo in professional packagings (1, 5 or 20 liters) for use by groomers and breeders. Dilution : 1 volume of shampoo for 5 volumes of water. Suits for frequent use. This ear lotion can be used once a week. The menthol formula washes and desodorizes your pet ears without irritaiting. Available in 125 ml tube. This ocular lotion washes and protects your dog's eyes against dryness, without irritating the mucous membranes. Gentle enough to be used daily. Available in 125 ml tube. Golden bone-shaped giftbox containing a bottle of Oh My DOg perfeume (100ml) and a 200 ml jojoba shampoo (ref C7001). Ideal for resale in pet boutique or grooming salon. Golden bone-shaped giftbox containing a bottle of Oh My DOg perfeume (100ml) and a 200 ml protein shampoo. Ideal for resale in pet boutique or grooming salon. Golden bone-shaped giftbox containing a bottle of Oh My DOg perfeume (100ml) and a 200 ml puppy shampoo (ref C7021). Ideal for resale in pet boutique or grooming salon. Golden bone-shaped giftbox containing a bottle of Oh My DOg perfeume (100ml) and a 200 ml white coat shampoo (ref C7011). Ideal for resale in pet boutique or grooming salon. Perfumed with mint, this natural enzymes based spray helps to reduce the bacterial proliferation in your dog's mouth and limits tartar formation on teeth. NON TOXIC, can be safely ingested by your pet. Available in 125 ml tube.